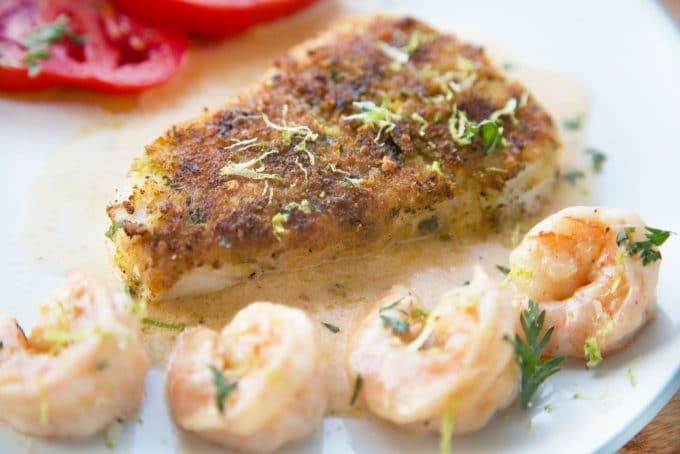 Perfect for your next date night or when you're entertaining, my Lime Crusted Chilean Sea Bass will bring smiles to your table. 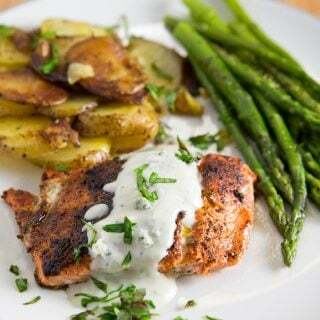 This restaurant-style dish is easy to make and oh so delicious! How many of you have heard of Chilean Sea Bass? Its actual name is Patagonian Toothfish and it can be found in the southern oceans closest to the Antarctic. It’s a pretty ugly fish but when filleted, it produces a solid piece of flesh, which is sweet in flavor and OMG delicious. One valuable characteristic of the toothfish flesh is that it contains a high level of Omega-3 fatty acids that are released when cooked. Omega-3 fatty acids have become recognized for their health benefits. It’s delicious and healthy and that’s a win-win in my book. And that my friends, is why I decided to share this easy and delicious restaurant style recipe with you. While on a Costco run this week (for wild caught seafood) I was very happy to find Wild Caught Chilean Sea Bass. If you’ve ever wondered how this fish got such an elegant name, wonder no more. Patagonian Toothfish are named for the sharp teeth on their upper jaw, but that wasn’t a customer friendly name, so in 1977 a fish wholesaler, looking for a name that would be attractive to the American market renamed the toothfish “Chilean Sea Bass”. Over the years the toothfish was seriously overfished by poachers in the Antarctic giving it a bad reputation as a non-sustainable fish. The good news is new fishing regulations have helped. And in Australia, Chilean Sea Bass is now certified sustainable, because of the changes that have been made over the last two decades. The Best Choice for sustainable toothfish being Heard Island, McDonald Islands Fishery and Macquarie Island Fishery, which are all Australian Companies. Sea Bass is not an economical fish and that’s another reason you won’t see it in too many stores, but it’s definitely worth the price. 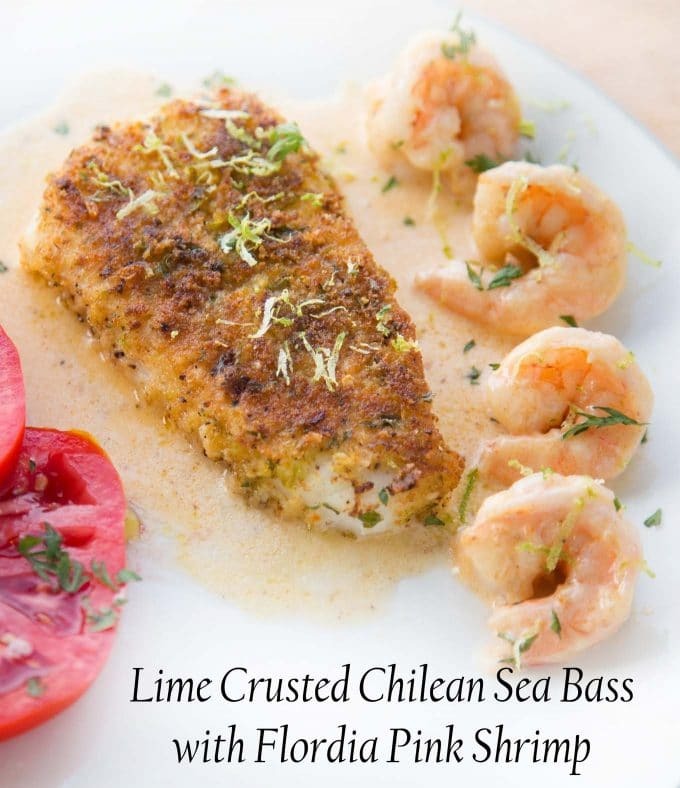 Chilean sea bass is a buttery, flaky, melt-in-your-mouth fish and paired with a good sauce can be heavenly. 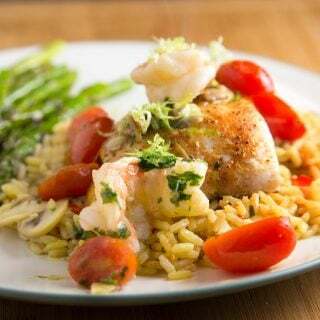 I made a fairly simple cream sauce for my sea bass, using shells from shrimp I’d been saving ( I save the shells in my freezer over the months to have enough to make a shrimp stock, and only needed a handful for the sauce). While the recipe may seem a little complicated, it really isn’t. It’s simply a matter of timing and would make a great date night dinner that you and your significant other could make together. place shrimp shells along with water in a saucepan. Bring to a boil and let simmer for 10 minutes until water has been reduced by half. Add cream and old bay to saucepan. Continue to simmer allowing this mixture to reduce by half. Strain sauce and return to pan adding lime juice and putting on low heat to keep warm and continue reducing. While sauce is cooking prepare sea bass. Mix most of the lime zest (reserve some for garnishing) into the bread crumbs along with the cajun seasoning. Mix well. rinse sea bass fillets and season with sea salt and black pepper. Place one side of the fillet in the bread crumb mixture pressing it into the bread crumbs to get a good coating. Heat a frying pan and allow to get hot. 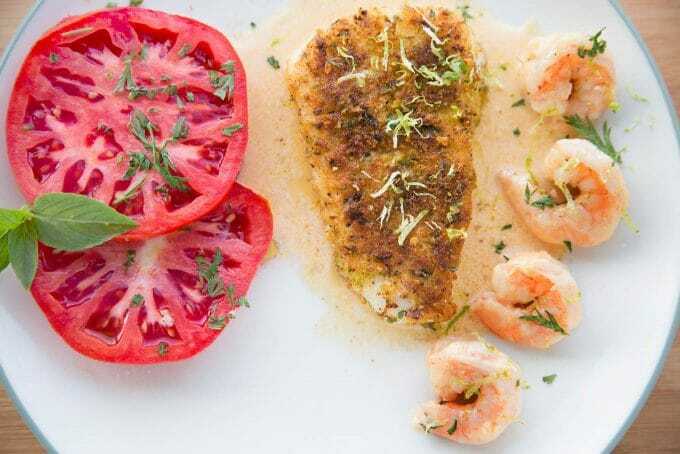 Add cooking oil and place breadcrumb side of sea bass into the pan allowing to saute for about 2 minutes or until it has good color. Turn fish over and sear the other side for 1 minute. 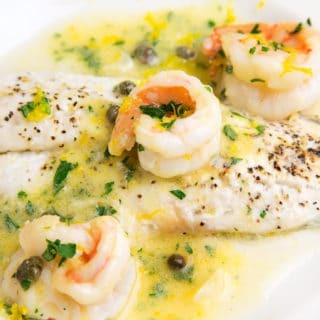 Remove from saute pan and place in a baking dish adding 2 ounces of water to the dish to keep the fish moist. Place in 350-degree oven and cook for 15 to 18 minutes. While the stock is reducing and the sea bass is cooking, in another saute pan add a little olive oil and add shrimp to pan to saute. Cook shrimp until almost done but not cooked completely. 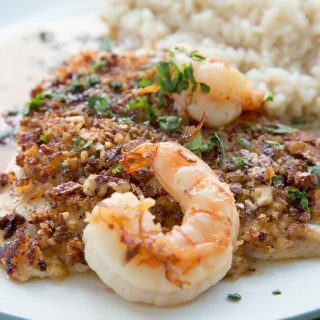 When the fish is just about ready, add the reducing sauce to the pan the shrimp are in and continue to cook allowing the shrimp to finish cooking. To plate the dish spoon some of the sauce on the dish, placing the finished sea bass on top of the sauce and arrange the cooked shrimp around the fish. Garnish with lime zest and parsley. Serve the rest of the sauce on the side along with your favorite side dishes and enjoy! I’m looking for Lent recipes. We eat a lot of fish during that time in Mexico. This recipe is perfect. Printing now! I love your recipes, but chilean sea bass is overfished. Can you recommend a substitute using sustainable seafood? 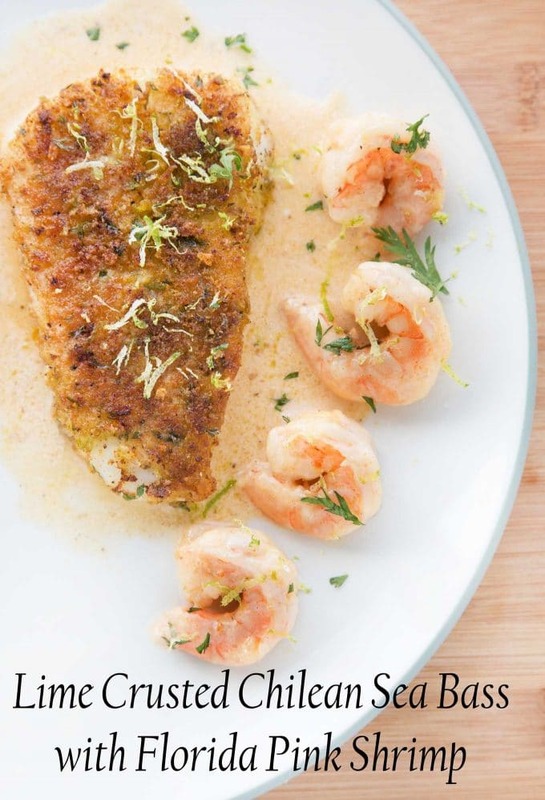 The recipe will work with any of your favorite mild white fish. 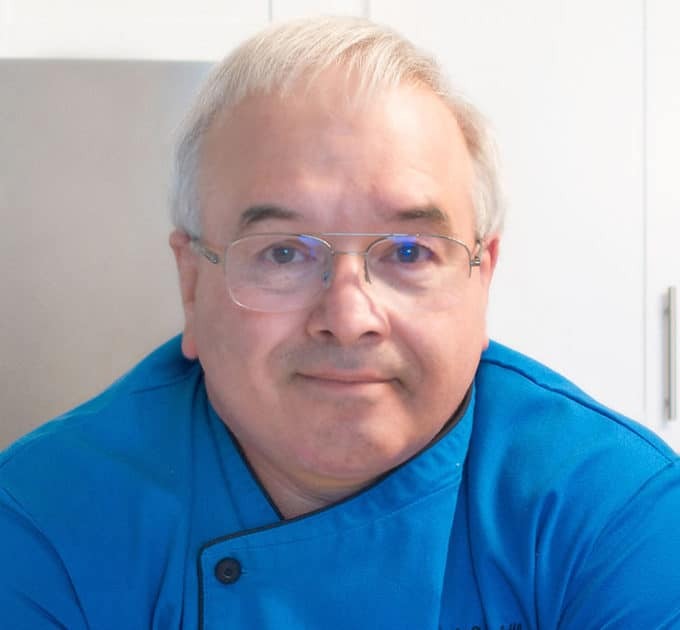 I love Chilean Sea Bass but it’s hard to find here on the east coast – Boston area. Would his recipe work with any other type of fish? Sounds delicious !!! you can use any type of firm white fish for this recipe. Thanks so much for asking! You’re right – it’s simpler than it reads – the crust you’ve kept on top of the fish looks delicious – the star of the dish. 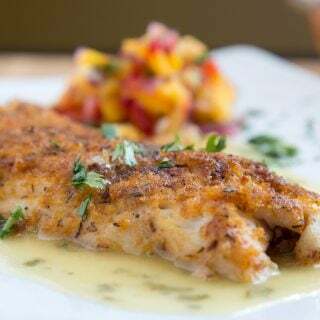 Lovely recipe – from an unusual fish! Thanks!